We originally had an enquiry in Autumn 2015 from the PA to a director of an interiors company in London who had bought a property in Lynchmere on the West Sussex/Surrey border. 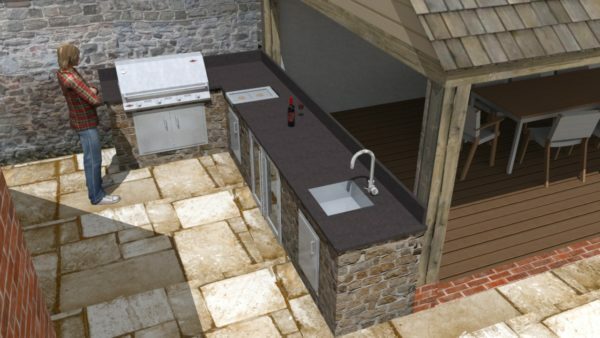 He was after an outdoor cooking area so after some lengthy discussion and negotiation we prepared a Sketch-Up cgi plan based on a detailed survey undertaken in 2016. The Outdoor kitchen Lynchmere was part of an extensive remodelling of the house and grounds which included an oak framed covered lounging area adjacent to the kitchen and swimming pool. 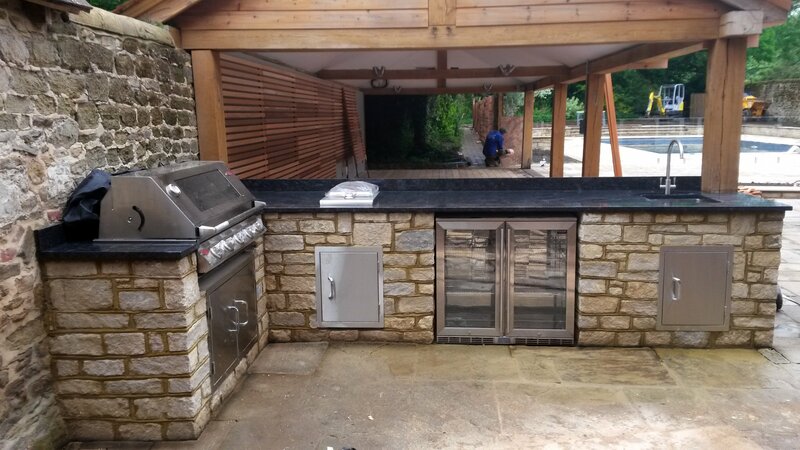 We began the build of the outdoor kitchen Lynchmere in Spring 2016 using cropped Purbeck stone already being used in the garden landscaping and incorporated a large 4 burner Beefeater LPG Barbeque, side burner and stainless steel cupboard doors, a double Blastcool outdoor fridge and Franke sink and tap. We finished it off with a polished black granite worktop and up-stand. As far as we know, the client, who travels and is away a lot, occasionally uses the cooking area for entertaining when he is in the UK.